When a book’s writing is so evocative that you can practically smell and taste the sights of the eponymous Night Circus as well as seeing them, then you know you’re onto a winner. Le Cirque des Rêves with its cast of quirky characters is just the backdrop though, the stage for the magic contest between Celia and Marco, two young illusionists who have been trained since childhood to compete in this game. Feuds between aristocratic houses might be the stuff of medieval-inspired fantasy (see: A Game of Thrones, for example), but they’re also the stuff of Butcher’s imaginative Cinder Spires series, you just have to also through steam-powered ships and magic warriors into the mix. And what a wonderful mix it is. I feel like everyone on earth must know of A Song of Ice and Fire, and if not you’ve probably heard of what’s going down on any given week’s episode of Game of Thrones, because it’s practically impossible to exist on the Internet without being spoiled. But the books are just as good, if not better, and the deadly game for control of the Iron Throne is as intriguing and exciting as its TV adaptation promises. Plus with so many characters there’s bound to be a few you love and root for to the bitter end… and, really, that end can come sooner than expected because every character is fair game – keeps things tense! Two masters of fantasy, Pratchett and Gaiman, do the Apocalypse. No, really, that’s pretty much the shortest synopsis of this weird and wonderful book I could possibly give. It’s hilarious, it’s smart, it’s incredibly readable and the friendship (or otp depending which fanfic you read) of the angel Aziraphale and the demon Crowley is one of my favourites ever. A horrifying picture of dystopian London is populated by an underground network of ostracised clairvoyant individuals, collected into gangs of criminals and under control of their respective Cohort’s Mime Lord. A secret, allegedly decimated Oxford is populated by strange Otherworldy creatures called the Rephaim who are given sacrifices of clairvoyants at periodic intervals known as “Bone Seasons”. Why? Read it and find out, and I promise you will love it. V.E. Schwab is a master of YA fantasy but her Shades of London books will always be a firm favourite of mine. They feature parallel versions of “London”, each with differing levels of magic, a traveller between these words who possesses a mighty fine coat (gotta have a good coat, see also: BBC’s Sherlock), a prince that’s something between Captain Jack Harkness and Prince Harry, a badass heroine who works a Captain Jack Sparrow ‘bring me that horizon’ vibe… have I caught your attention yet? It’s hard to describe the Raven Cycle, just as it is hard to describe why on earth they are so good. A group of four Virginian public school boys search ley lines for long-lost ancient Welsh king’s burial site. Daughter of household of physic women stumbles into them and their quest, lives are changed inexorably. The writing is masterful, the characterisation amazing, and I seriously want to be part of Gansey’s little gang, sign me up. Now, I’m aware saying that Harry Potter is nothing more than a fantasy series might be a tad controversial since all of those raised on the tales of J.K. Rowling’s Hogwarts believe it to be a real-life place hidden away somewhere in Scotland. I think that lasting and engrossing aspect of the Harry Potter books is why they obviously hold the top spot in this list – they’re incomparable, they’re compelling, and they introduced a generation of kids to the wonder of reading, I know they sure played a big part in my growth as a reader. That was a peek into my top ten all-time favourite fantasy books. 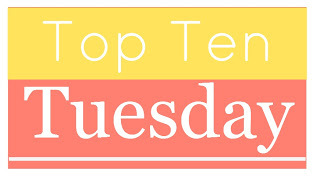 Do any of these books feature on your Top Ten list? Are any of them on your TBR list? Comment below/link your own post below if you have one – I’d love to read it! I definitely second A Darker Shade of Magic, which i read earlier this year and liked a LOT. And of course the Raven Cycle, although I must confess my favorite Stiefvater novel is still The Scorpio Races! You’ve definitely convinced me to check out The Aeronaut’s Windlass, as well. That is the absolute best summary I’ve ever read of A Darker Shade of Magic. I hadn’t thought about how much he’s like Jack Harkness, but you are so right! Ah, the swagger a good coat brings!! Some lovely books on here but a special shout out to The Graveyard Book. Love that book. Aww thanks, and I completely agree! I was so surprised by just how much I loved The Graveyard Book. I knew it would be good but I didn’t realise just how wonderful it was – I do now, haha.